Tour the city as the sun sets on our fat-tire minibikes! This tour comes with complimentary bragging rights to share! Tour times reflect availability due to sunset. Tour the city at sunset on our fat-tire minibikes and watch Austin come to life at night! Our Road Captains will make sure you get to see some of the best points of interest in Austin. We keep our tours exciting and unique which means no two rides are the same! 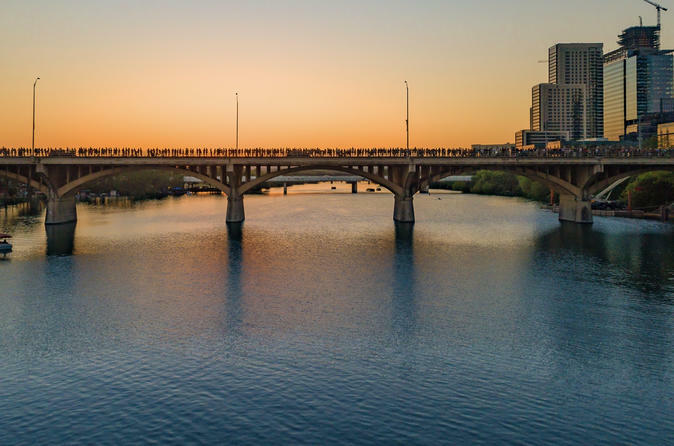 These could include the Moody Theater, the Driskill Hotel, Stevie Ray Vaughn statue, and some of the numerous street art and murals that keeps Austin weird! You haven't seen Austin until you've seen it on a minibike! If you can ride a bike, you definitely can ride our minibike, as long as the driver is at least 16 years of age and the passenger is at least 48" tall. Since our minibikes have a top speed of 20 MPH and are considered electric bicycles there is no license needed. You will be on the road and smiling before you know it. Be sure to bring your smartphone or camera to capture all the memories! Let's ride!